Financial security just doesn’t happen – it takes planning. When planning for retirement, it’s important to start saving and investing early. After working hard to earn your money, you want your money to work hard for you too. The more time your money has to grow, the better off you’ll be. Compounding is one way for your money to earn money. When your money is compounded, it increases in value by earning interest on both the principal and accumulated interest. This is a little different from earning simple interest. Let’s see how they both work. Simple interest is a return that pays you a certain percentage based on every dollar you put in your account. Let’s say you opened a savings account with $100 in January. If the bank paid 5 percent annual interest on that deposit, you’d receive five cents for every dollar in your savings account for the whole year. At the end of the year, you’d have $105. That’s $5 more than the principal amount you started with. Any interest you’d earn after the first year would still be based on the principal amount of $100. 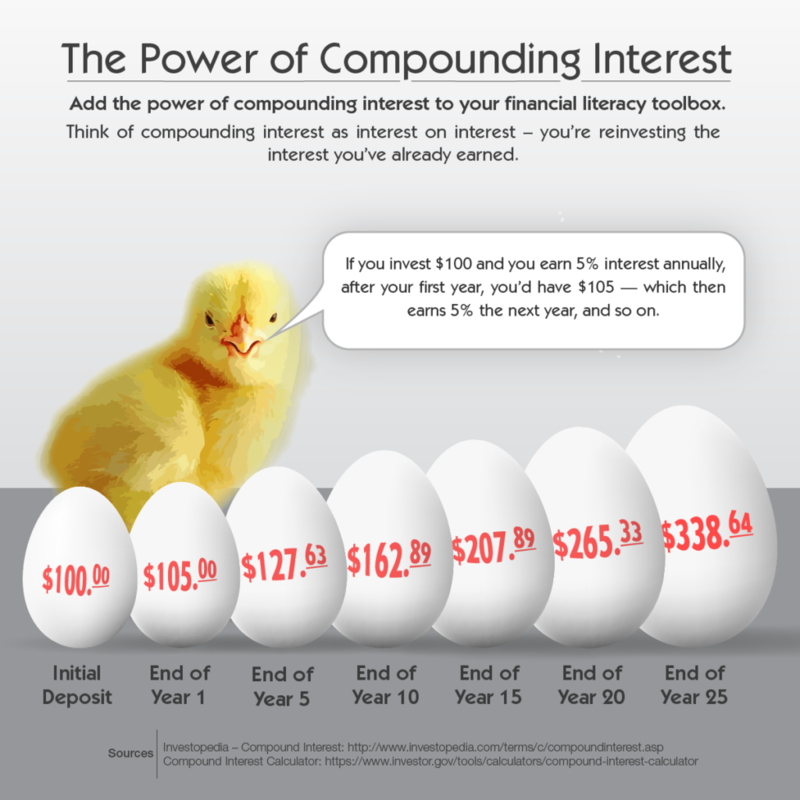 While you receive some extra money with simple interest, compounded interest can give you more bang for your buck. Let’s look at the above example again, but use compounded interest this time. If that $105 remained in your account, and the bank paid out another 5 percent interest, by the end of the second year you’d have $110.25 in your account. That $105 increased by $5.25. Not only did you earn interest on your original $100 in year one, you earned interest on year one’s interest. That’s the great thing about compounding. In just two short years, your money has earned $110.25. If we were still using simple interest, you’d only have $110 after two years. If you’re thinking about boosting your personal savings for retirement, look into accounts that use compound interest. The sooner you can start saving, the more time your money can grow. Content last revised June 22, 2016. This entry was posted in General News, Members and tagged compound interest, compounding, ERS, Information is the Key, interest, investing, investment, members, New York State & Local Retirement System, NYSLRS, personal savings, Personal Savings Plan, PFRS, Preparing to Retire, retirement planning, retirement security, simple interest on June 22, 2016 by NYSLRS.